Printer: Franklin, H. & H.
Drapers shops developed from the 18th Century specialist shops like the hatter, silk mercer and the hosier. Assistants were apprenticed and had to spend many years learning their trade, working for established drapers until they had saved enough to set up their own business. 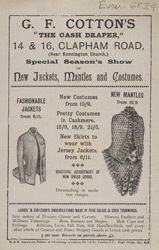 Drapers originally kept their materials behind the counter only bringing out the material they felt was appropriate for each particular customer. Browsing was discouraged and customers had to ask to see particular items like underwear as this was never displayed anywhere so as not to cause offence.